Inexpensive. A couple of $5 balls of good-quality sock yarn are all you need. Infinitely variable to support all your creative urges. Good project for traveling, TV watching, and condo board meetings. Once you get familiar with the basic template, you can knit socks practically on autopilot. A good sock has a constructed heel. They are more comfortable, and look better than those terrible heel-less tube socks. My top-down training sock pattern is all you need to get started. It uses standard sock-creation techniques to build a miniature sock, and gives you a chance to practice your technique without committing to hours of work with laceweight yarn on 2.5mm needles. The key measurement for sock sizing is the ankle circumference. For women, this is usually about 8 inches, for men about 10 inches. Measure the ankle of the foot in question for the best fit. From this key measurement, subtract 1 inch when knitting for adults and half an inch when knitting for kids. This assumes that you are knitting with typical sock yarn. If you are knitting with a much thicker yarn, do not subtract as much from the ankle measurement. Get the gauge of the yarn you want to use. This is, of course, best measured from an actual gauge swatch -- even better if done in the round rather than flat since that's how the sock will be knit. When using a yarn not originally meant for socks, use needles a size or two smaller than the ball band calls for. 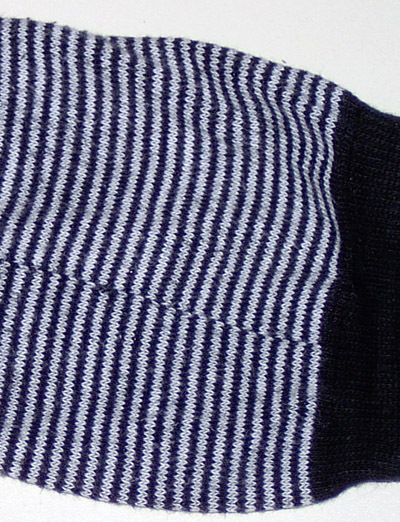 Socks are knitted at a tighter gauge than other garments, to maximize wear. You'll find that they feel better on your feet that way, too. The number of stitches to cast on is the magic number, X. Once you've got that, you can create an entire pattern. X is the stitch gauge (per inch) multiplied by the ankle circumference, minus 1 inch or half an inch, as the case may be. For example: If your yarn provides a gauge of 30 sts over 4 inches, divide by 4 to get the number of stitches to the inch (7.5 sts). Then multiply this number by the ankle circumference less 1 inch. So for someone with an 8" ankle: 7.5 x 7=52 sts. The number of stitches you cast on will also be determined somewhat by the ribbing you want to do. K1 p1 rib requires an even number of stitches; k2 p2 rib requires that the number of stitches be divisible by 4. If not, the ribs won't match up at the beginning of the round. Once you've built a sock using the Training pattern above, you're ready to move on to creating socks that can actually be worn. This section takes you through the steps of defining the pattern. It's based entirely on the number of stitches to cast on, X, as calculated above. Cast on X stitches; divide evenly across 3 double-pointed needles. A long tailed cast-on is recommended; it's nice and stretchy. Put a stitch marker at the beginning of the round. Knit a few rows of ribbing -- check to make sure it's not twisted. Typically, the ribbing is done with needles a couple of sizes smaller than what you'll use for the rest of the sock. Keep ribbing some more. Change to your larger needles about an inch or two into your knitting. If you want to have a ribbed cuff and a plain leg, switch to stockinette stitch when you feel you've knit a deep enough cuff. Stockinette stitch provides a nice basis for colour or pattern work, but a fully ribbed leg provides a better fit. Stop when the cuff and leg are as long as you want them to be. Starting at the beginning of the round, put half the stitches on one needle. You can lose the marker at this point. Put the rest of the stitches on a stitch holder or a spare needle. The heel will be knitted back and forth on a single needle. Work in stockinette stitch (knit right side, purl wrong side) for 2/3 to 3/4 as many rows as there are heel stitches, slipping the first stitch of every row but the first. For a sock less than 50 stitches around in total, 2/3 is good; with more stitches, use 3/4 as the ratio. For example, on a 48-stitch sock with 24 heel stitches, you will work 16 rows; on an 80-stitch sock with 40 heel stitches, use 30 rows. If it's an odd number or fraction, always round up to the nearest even number. Still working on the heel stitches, you're now going to reduce and turn the heel. A bit more math is required here. Divide the number of heel stitches by 3. For a 48-stitch sock, you have 24 heel stitches. This divides evenly as 8-8-8. For a 32-stitch sock with 16 heel stitches, you get 5-6-5. Repeat these last two rows until all the stitches have been worked. The right side will be facing. Knit 1 row on all stitches. For the mathematically inclined, the number of stitches you have now is x/6+2, rounded up to an even number. On your 48-stitch sock, that's 10. On the 32-stitch sock, that's 8.
side, you'll be picking half the number of heel *stitches you began with -- that is one quarter of the cast-on stitches. Knit the stitches that remain on the heel. Using a new needle, pick up the required number of stitches along the first side, using the loops created by the slipping in step 2. This will be referred to as Needle 1. Using another new needle, knit across the instep (non-heel) stitches. This will be referred to as Needle 2. Using one more new needle, pick up the required number of stitches across the other side, using the loops created by the slipping in step 2. With this same needle, knit half of the remaining heel stitches onto this same needle. This will be referred to as Needle 3. You will now have a small number of stitches left on your needle, ready to be worked. Slide these onto Needle 1. Alternate decrease rounds and even rounds until you're back to X, the number of stitches you cast on originally. Once you're back to the original number of stitches, X, knit until the foot of the sock measures 2 inches less than the length of the actual foot that will be wearing the sock. Recall that the center of the round is the center of the heel. Make sure your stitches are distributed as follows: 1/4 of the stitches on Needle 1 starting at the center of the round, 1/2 of the stitches on Needle 2 (these are the stitches for the top of the foot), and the remaining 1/4 on Needle 3. Needle 1: knit to last 3 stitches, k2tog, k1. Needle 2: k1, ssk, knit to last 3 stitches, k2tog, k1. Needle 3: k1, ssk, knit to end of needle. Alternate decrease rounds and even rounds until 8 stitches remain. There as many ways to finish a sock as there are to make one. Which method you choose is a matter of taste, skill and patience. You can reduce the toe down to 8 stitches and do a two-needle bind-off. Or reduce down to 4 stitches, cut the yarn leaving a long tail, thread this tail on a yarn needle and pull the thread through the 4 stitches, pulling them tight. Or cast off both sides and sew them together. The neat and tidy prefer grafting, also known as Kitchener stitch, for a seamless toe. See Teresa's excellent article in the Summer 2004 issue of Knitty. Wool is absolutely the best choice for sock knitting. It's breathable, comfortable and durable, with a bit of natural "give" to help with the fit. It also feels nice running through your fingers. Most commercial sock yarns are a wool and nylon blend, spun very tightly, and machine washable. The spin and the nylon add to the wearability. A non-sock-specific yarn can be used, but will not wear as long. Cotton feels and looks great, but doesn't always have the give or durability you want for socks. If you do want to use cotton, choose a purpose-built sock yarn, like Lang Jawoll Cotton Superwash or Cascade Fixation. These are both blends of cotton with other fibres. Only for kids, and even then, only if absolutely necessary. Synthetic yarns don't breathe and the resulting socks can get very sweaty and smelly. Synthetics also don't have much flexibility or give. The only exception to this rule is for special effects yarn. I've seen some marvellous things done with furry and eyelash yarn used in the cuff. "Proper" sock yarn gauge is 28 or 30 stitches across 4 inches/10cm on 2-3mm needles. If you want to be able to wear your socks in your everyday shoes, you'll need to use one of these yarns. Don't be afraid. It may seem like a lot of stitches to work to fit around your foot, but it's still fewer than the sleeve of the average adult-sized sweater. Marvellous! Stripes, Fair-Isle like patterning, random fun shapes and areas. The ball band will have a picture of what you can roughly expect. There are lots on the market; some popular brands include Lang Jawoll, Regia, Fortissima, and Koigu. The ribbing on the cuff is there for the fit -- to create stretch to fit around the ankle and leg. It's entirely flexible. Have fun with it. Other ribbing patterns work nicely: 2x2, 3x3, or odd combinations like 3x1. Even combinations of ribs (e.g. 2x2) do have more stretch. The mock cable rib looks very sophisticated, and is easy to do. It's a 4 row repeat, on a multiple of 4 sts. And if you want a loose, slouchy sock skip the ribbing entirely. Stockinette stitch will curl a bit at the top. Try 3 or 4 rounds of stockinette stitch before the ribbing, for a sock with a rolled top that still stays up. A commonly used stitch pattern for the heel rows (not the turned part, just the initial rows of the heel), this provides a layer of reinforcement. On right side rows, slip 1 knit 1 across the row. On wrong side rows, slip the first stitch, and purl the rest. Pretty much anything goes in the body of the sock itself. 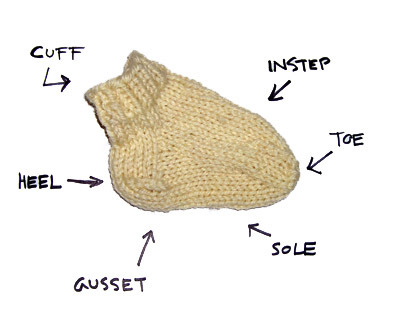 The only real guideline is that the sole should be a simple stockinette stitch, for comfort. Combinations of knit and purl stitches on a stockinette stitch background create textural interest. Rounds in reverse stockinette stitch (that is, purl) provide a striping effect against a stockinette stitch background. Try a single round of purl every 5 or 10 knit rounds for stripes. Cable and lace patterns are both very effective and attractive in sock designs. Check your favourite knitting stitch book for ideas. Be inspired by other knitted garments. I've seen very effective socks with basketweave patterns in the cuff and on the instep. Look up some traditional gansey patterns -- they're designed specifically for knitting in the round. Horizontal stripes are easy -- make them as wide or as narrow as you'd like. Try irregular stripe widths for a bit of visual variety. Vertical stripes are just about as simple, and provide the wonderful side effect of lining the socks with an extra layer of yarn for thickness and warmth. To create vertical stripes in stockinette stitch, simply work with two different coloured yarns and alternate the yarns for every other stitch. To create vertical stripes in ribbing, cast on using two different yarns at the same time, alternating yarns. Then work k1 p1 ribbing, alternating the yarns in same order as the cast on. You'll get the "up" ribs in one colour, and the "down" ribs in the other. The ribbing on these Turkish style socks (a variation of the pattern in the Socks: Spin-Off pattern book) is done in two colours. 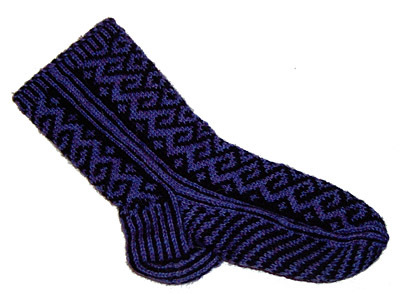 Fair Isle Socks lend themselves very well to Fair Isle style colour work; that is, using two or more colours at the same time across the entire row. Fair Isle typically features small, repeating motifs or patterns across the row. Vertical stripes are the simplest possible form of Fair-Isle colour work. All Fair Isle knitting has an extra layer of yarn on the wrong side (the strands) and creating a warmer and comfier sock. 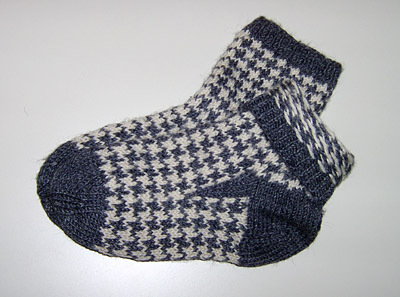 My favourite pair of hand-made socks feature a simple houndstooth pattern, done with a stranded Fair Isle technique. In the picture, I've turned down the cuff of one of the socks so you can see the stranding. These types of designs can be done on socks by knitting them (gasp!) flat, on two needles, and them sewing them up. Argyle socks are often created this way. Although knitting flat is a popular method for sock knitting, it's not as neat and requires post-knitting construction -- the sewing up. Whether you prefer sewing or knitting in the round is entirely a personal preference. For me, the less time spent sewing up the better. The adventurous are encouraged to seek out Mary Thomas's description of "festive knitting", and Priscilla Gibson-Roberts' incomparable "Knitting in the Old Way" for guidance on working colour in the round. 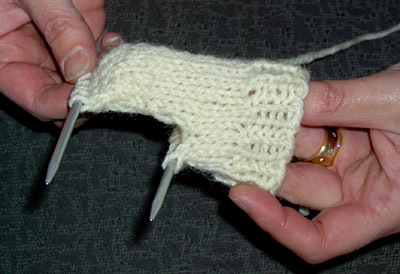 Always stop after you've completed a couple of rounds of the cuff and check to see if the knitting is twisted. Always. There is no fix for this, so the sooner you check, the better. -keeping the two working needles -- that is, the one you're knitting stitches from, and the one you're knitting them onto -- above the others, and keep the left needle above the right. -pulling the yarn extra tight when working the stitches at the end and beginning of a needle. 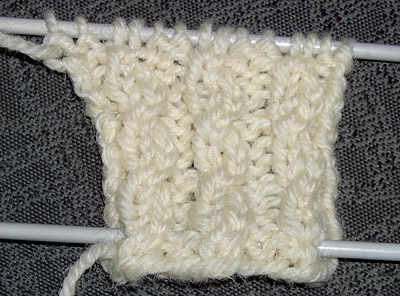 Cast on using larger needles, or cast on over two needles held together. Other stretchy cast-on techniques include the Twisted German, and Channel Island techniques. Check your favourite reference book. When knitting vertical stripes, you'll notice that something strange happens at the beginning and end of the round: the stripes never line up. This is not unique to hand knitting. I've got a pair of commercial knitted socks with narrow stripes, and the jog is clearly visible. Meg Swansen developed an excellent method to disguise the color jog, described in detail in an article in Knitters Magazine issue 45, Winter 1996. There's a great summary and pictures available here. There are thousands of websites with information about knitting in general, and about sock knitting specifically. These are a handful of my favorites. www.needletrax.com/mysocks.htm - features a few free patterns and an Excel spreadsheet that calculates a complete sock pattern for you, based on gauge and ankle circumference. www.knitty.com - check the archive: there are sock patterns in the Winter 2002, Spring 2003, Summer 2003, Spring 2004 issues. Kate, whose toes get very cold, knits in Toronto.